The evidence points to a large ocean impact event. 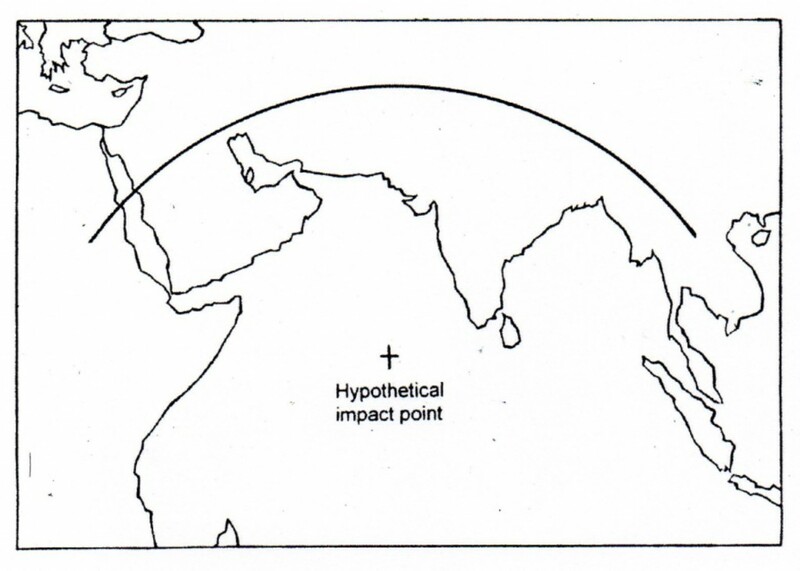 The evidence seems to suggest the most likely candidate for that past impact site was the Indian Ocean. In 2007 The Holocene impact working group announced the discovery of the 30 kilometer wide Burckle Crater south east of Madagascar in the southern Indian Ocean which they believed was caused by a comet impact around 2800-3000 bc. While this crater discovery seems to align with my supposition it is still not clear whether this was the specific large impact event my evidence suggests. A possible impact crater formed around 5000 years ago has been found in the Southern marshlands of Iraq although because of conflict and unrest there it still has not been researched and confirmed as a definite crater. If it is a crater these two impacts seem to suggest that a series of strikes of varying sizes, as mentioned before, has occurred over a relatively close period of time in our near past. A rough guesstimate of the size of the object could have been between 1 and 3 kilometres in diameter. A 1 kilometre size impacting object would have released over 100,000 megatons of energy. A 3 kilometre wide object over 1,000,000 megatons of energy. The total energy of all explosives used in World War Two (including the Hiroshima and Nagasaki bombs) is estimated to have been 3 megatons of TNT. The impact in degrees would have produced a groundshock. A superheated blast wave. An uplift of sea water into the sky and a corresponding deluge of water from the sky. A fallout of flaming debris and uplifted material. A tsunami wave. Caused severe weather conditions surrounding the impact area. Created an overspreading dust cloud. And perhaps triggered volcanic activity, earthquakes, and further tsunamis along slipping fault lines. Such severe impact commotion would be certainly noticed by the ancients living at the time.